A few short days ago, I was honored to join the Class of 2021 in their White Coat Ceremony, as my first official duty as Dean of the University of Arizona College of Medicine – Phoenix. I met an extraordinary, committed group of students, who in their personal class oath embraced the sacred responsibilities of their new profession. Indeed, in my first week here, I met many other impressive students, faculty and staff. You have an energy, exuberance and confidence that we can all do very special things together to advance our missions of education, research and improving health. In just 10 short years, this College has begun to develop a very special educational brand and culture, which we want to continue and grow. With full accreditation, our medical school begins a new chapter in its journey toward developing programs of national and international distinction. A key mission for our medical college is to foster innovation and excellence in clinical care through our partner hospitals in the community. Developing clinical areas of expertise and training will be paramount for us as we move to the next stage of our growth. Another central focus for us will be to advance scientific discovery and translation to improve public health. We have enormous potential because of the advanced level of care and excellent physicians and researchers here and in the Phoenix metro area. I look forward to discussions with our students, faculty and staff on the Phoenix Biomedical Campus. I also will make meeting all nine of our clinical partners and our 1,600 associate clinical faculty among my top priorities. 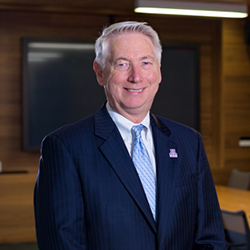 It truly is an honor to work with you as your dean, as we all strive to make the College of Medicine – Phoenix a leader in education, research and innovation.